This giveaway is now closed. Winner has been chosen, notified, and is listed at the end of this post. Thanks for visiting! Time for a giveaway! This time we’re giving away a pattern, and some background fabric to get you started. Mary Herschleb of MH Designs has dozens of paper pieced patterns. 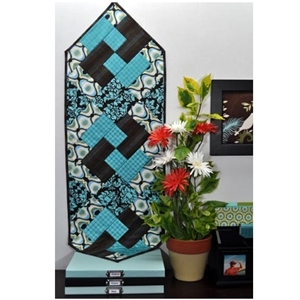 You’ll find wall hangings, placemats, table runners and toppers, ornaments and more. The changing seasons, nature, vacations, family, and humor all have found a place in her projects. Fall Wreath is a 15″ x 15″ wallhanging or mini table topper that can be as colorful and as vibrant as you want. Pull our your scraps or buy a handful of fat eighths. To get you started we’re going to include 3/4 yard of a background fabric. This will give you enough for the block background, for the borders, the backing, and even the binding. All you need to add is the color! Marble Mate Ivory by Moda will make a perfect background. It doesn’t have a distracting pattern but it does have enough value variation to make it interesting. You should have just a little left over to add to your scrap pile. You have a few chances to enter the giveaway . . . Check out all the MH Designs patterns and leave a comment on this post naming one of the patterns that you like. 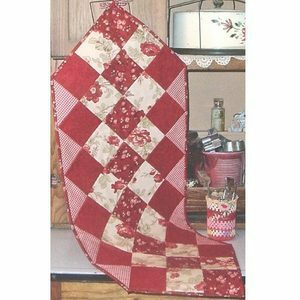 Browse the quilting fabrics and leave a comment naming at least one fabric you would use for this pattern. Share our Facebook post about this giveaway, and then leave another comment letting us know you shared. Share (on Facebook) again on day 2 (Saturday) of the giveaway, and then leave another comment letting us know you shared. Share (on Facebook) again on day 3 (Sunday) of the giveaway, and then leave another comment letting us know you shared. Follow us on Pinterest, and then leave a comment telling us you followed (or that you already do). That’s SIX chances at winning. Just be sure to leave a comment here on the blog for each of the chances, as we will choose a winner from the comments using a random number generator. Giveaway ends midnight (CST) Sunday, September 30th 2012. Open to US residents only. Congratulations to Deb G.! Happy sewing! Country Manor is a collection of beautiful deep browns, roses, creams and a touch of sage. And we’re giving away five fat quarters! And the winner of the five fat quarters is….. VickiT! When we posted our Country Manor Fat Quarter Giveaway we asked you to comment and tell us your favorite fabric collection and said we would choose a winner with a random number generator. 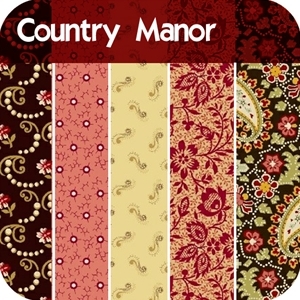 Country Manor Quilt Fabric – Fat Quarter Giveaway! 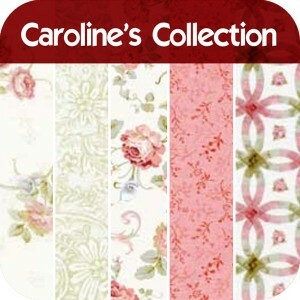 Country Manor by Paula Barnes for Marcus Fabrics is a collection of browns, roses, and creams with a soft romantic look. They would look great in a living room or bedroom. 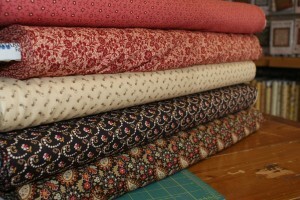 And we’re giving away a bundle of FIVE FAT QUARTERS! All you have to do is leave a comment (the comment button is just above the title of the post), and tell us what is your favorite fabric collection – besides this one, of course! If (when?!) you win, here are a couple patterns that only require four fat quarters. That leaves the last fat quarter for the binding – perfect! 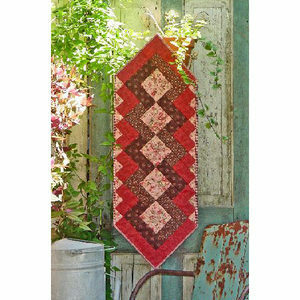 This is the original Fat Quarter Table Runner by Out of the Blue. With strip piecing it’ll be finished before you know it, and since it is quilt-as-you-go, when it’s finished it’s already quilted! 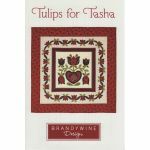 Sondra Davison designed several more Table Runners in this series. Each of them only needs four fat quarters. Here’s a few of them. Remember, to enter the giveaway, just leave a comment telling us the name of your favorite fabric collection - besides this one, of course! The comment button is just above the title of this post. Giveaway is open until midnight (CST) Thursday, August 30th. Winner will be selected by random number generator. Have you heard about Janome’s Friend-to-Friend Challenge? In an effort to grow their online community, Janome has given themselves a challenge to reach 20,000 likes on Facebook. When that happens they will give a TWO machines (yes, TWO!) and a Mystery Bag filled with patterns, fabric and notions!!! Visit Janome.com each day and read their daily post. You’ll learn a little something every day, so even if you don’t win the fantastic prize package, you are still coming out ahead! Then leave a comment on the post. This part is important – the comment is what enters you into the contest. Then head over to the Janome Facebook page and “like” Janome so you can watch the number of “likes” grow. As soon as it hits 20,000 one of those Janome.com commenters is going to be making room in their sewing room for TWO new pink ribbon Janome machines! As the graphic says, we are re-confirming our mail list. Many of our older mail list members never had to confirm they wanted to receive our email so in this modern day of SPAMMERS, we now need that confirmation. If you receive a request to re-subscribe, DO IT! If you don’t get our weekly newsletter this Wednesday, then your email address has not been renewed. Your choice is easy, You can subscribe here. You can also sign up at the QuiltersWarehouse website. On the right hand side there is a button that says “Sign up for our Newsletter”. Easy! Anyone who is a subscriber to our newsletter is automatically entered in the Fat Quarter giveaway. It doesn’t matter which of these methods you use, just do it! Leaving a comment here will NOT enter you in the giveaway! Hmm. Does that mean the winner is announced? 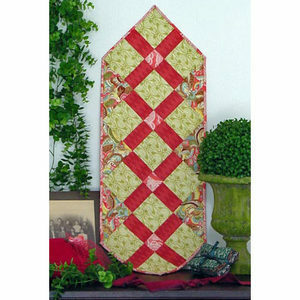 Or does it mean that A Bouquet For My Love quilt pattern is a winner? I think it means both! A random number generator selected a winner from all the comments left on our QuiltersWarehouse Facebook page and on our blog since we announced the pattern giveaway. And the winner is Jean! Congrats and have fun with the pattern! Popular Item of the Week! This was the most popular item of last week's Newsletter. Dress It Up – With Table Runners! Paper Piecing Patterns – Sew Satisfying!